KISS still love it loud. At this point, the biggest surprise you might get out of a KISS concert is if the band's current "End of the Road" tour is truly, honestly, the quartet's last road trip. We won't know that for a couple years, when the tour is slated to end, but assuming the hard-rock heroes are playing it straight, they're certainly going out in loud, fiery style. Monday's show at Spokane Arena was just the fourth of the tour, and it benefitted from a band still fresh and an audience duly amped up to see the long-running glam rockers do their thing. That thing? Delivering the most over-the-top stage show they can imagine, full of flashing lights, firebombs, massive video screens, floating mini-stages, blood and bassist Gene Simmons' disturbingly long flickering tongue. 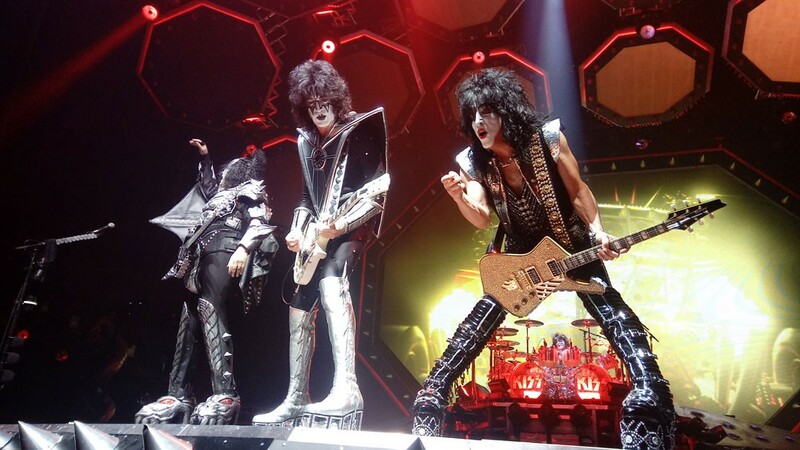 Simmons and band co-founder Paul Stanley, along with guitarist Tommy Thayer and drummer Eric Singer, wore the famous makeup that helped the band originally make its mark in the '70s, and played a show that went all the way back to their 1974 self-titled debut album ("Cold Gin," "100,000 Years," "Deuce," "Black Diamond") and stretched through one of their recent, largely forgettable studio efforts ("Say Yeah!" from 2009's Sonic Boom). Between, they played monster hits (five songs from 1976 classic Destroyer) and some gems from the non-makeup '80s KISS era ("Heaven's on Fire," "Lick It Up"). The band has a deep catalog, so no doubt some fans missed out on hearing their favorite tunes, but the band covered a lot of ground, so if this is a farewell jaunt, it's a fitting setlist. Stanley's voice was in fine form, far better than when I saw him five or six years ago — no doubt a benefit of the tour having just started. His banter was typical, thanking the fans for helping the band get in the Rock and Roll Hall of Fame, and announcing, "Spokane, you're not the biggest city on the tour, but that doesn't mean you can't be the loudest! It's up to you." I don't know if Monday's show was the loudest, but judging by the number of fans in face makeup, the lines to buy T-shirts selling for $50-$75, and the seats filled to the rafters save for a few pockets here and there, Spokane was certainly into this KISS gig.